When I saw that my Influenster Paradise VoxBox contained Suave's Moroccan Infusion Styling Oil, I was immediately eager to put it to the test. I have never tried a proper hair styling oil before, and this one from Suave looked really promising. It has all the qualities and benefits that I look for when it comes to hair care products, so it was bound to be amazing, right? Read on to find out what I thought of it! My thick hair is very dry, frizzy, and often lacks shine, so I am always on the lookout for products that will help nourish, add shine, and bring some life back to my tresses. Why I haven't given hair styling oils a chance in the past is beyond me. 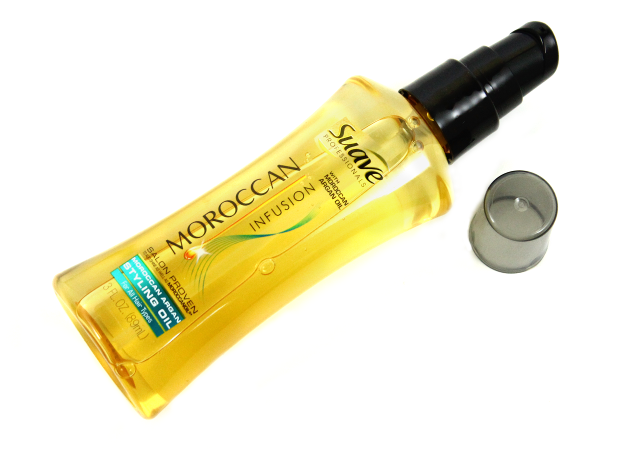 But I sure am glad that I came across Suave's Moroccan Infusion Styling Oil because it really is a game changer. I start off by applying 1 pump-1.5 pumps to damp hair, concentrating the product on the mid-shaft and ends where it tends to be driest the most. I either let my hair air-dry from there and sport my natural curls, or I can go for the straight and sleek look-which is what I have been favoring lately. Now that this hot summer weather is slowly phasing out and we are preparing for fall, I find that working with a blow dryer and flat iron is a much more tolerable process than it was in 90+ degree weather a couple weeks ago. After I am done styling, I immediately notice the difference in my hair. My hair is softer, shinier-not in an oily/greasy way, my ends look healthier, and my frizz isn't such a hassle to tame anymore. If I need to, sometimes I go back and apply a small amount of this oil after styling, to the ends to make them extra shiny and to tame down any little frizz that's poking out. Honestly, my hair hasn't looked or felt this good in a long time. 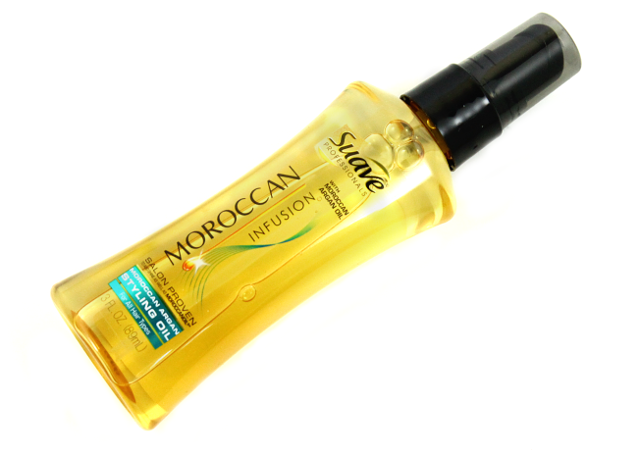 A sweet bonus to Suave's Moroccan Infusion Styling Oil is that it speeds up my hair's drying time, which means that my blow drying time is cut short. Love it! There is a musky fragrance to this styling oil, and although it is a little heavy at first, the scent quickly subsides and becomes pleasantly softer. I think Suave's Moroccan Infusion Styling Oil is worth checking out if you're on the market for an affordable hair styling oil that offers shine and conditioning benefits, without weighing hair down. My dry hair loves this stuff, so it's a definite repurchase for me once I am done using this one up. I am finally a hair styling oil convert. And I like it. 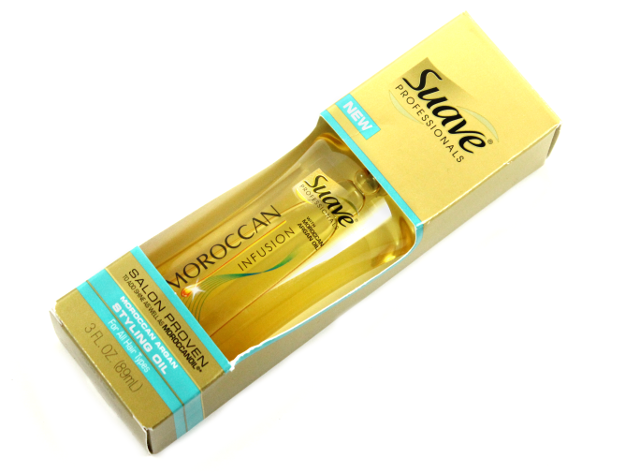 What do you all think of Suave's Moroccan Infusion Styling Oil? Which are your favorite hair styling oils? Disclaimer: I received this product complimentary from Influenster for testing purposes. For more information, please visit my disclosure page.